The F/A-18F Super Hornet is a tandem-seat, carrier-capable, multirole fighter and attack aircraft based on the McDonnell Douglas F/A-18 Hornet. Designed and initially produced by McDonnell Douglas, the Super Hornet first flew in 1995. 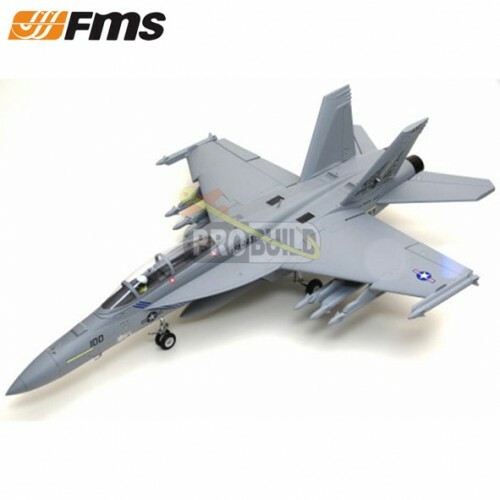 The Super Hornet entered service with the United States Navy in 1999, replacing the Grumman F-14 Tomcat, which was retired in 2006; the Super Hornet serves alongside the original Hornet..
FMS is proud to bring you this new and highly detailed 70mm ducted fan F/A-18F Super Hornet. Incorporating many of the new and advanced construction and assembly features such as the optimized screw based assembly, pre-installed ball links and a heavy-duty wing spar, the super hornet is quick to assemble and disassemble. Based on the original 64mm F/A-18 Hornet, the 70mm F/A-18F Super Hornet features rich details, clean lines, CNC-machined shock-absorbed landing gear sets, and a button-type canopy hatch. Included with the model are four decal sets that allows you to make your own Super Hornet and stand out in your airfield. The power system, which provides tremendous thrust and speed, utilizes our new and improved 70mm 12-blade EDF V2, KV1850 motor system. This brawny system, when coupled with a 6S battery, provides a resonating turbine engine sound. The EPO material ensures the durability and the environmentally friendly water-based paint ensures vibrant and glossy color schemes. Go get the Super Hornet and discover for yourself this new addition to FMS’s growing EDF fleet.